Sadie Catt has been visiting Woodstock, a small city in Ontario, Canada, for more than a decade. Two years ago she decided to start documenting the place, and the result is a photographic project of the same name that alights on the people and places of this unprepossessing corner of the world; contemplative pictures that seem to arise and dissolve, brief sketches and impressions of an unfamiliar environment. 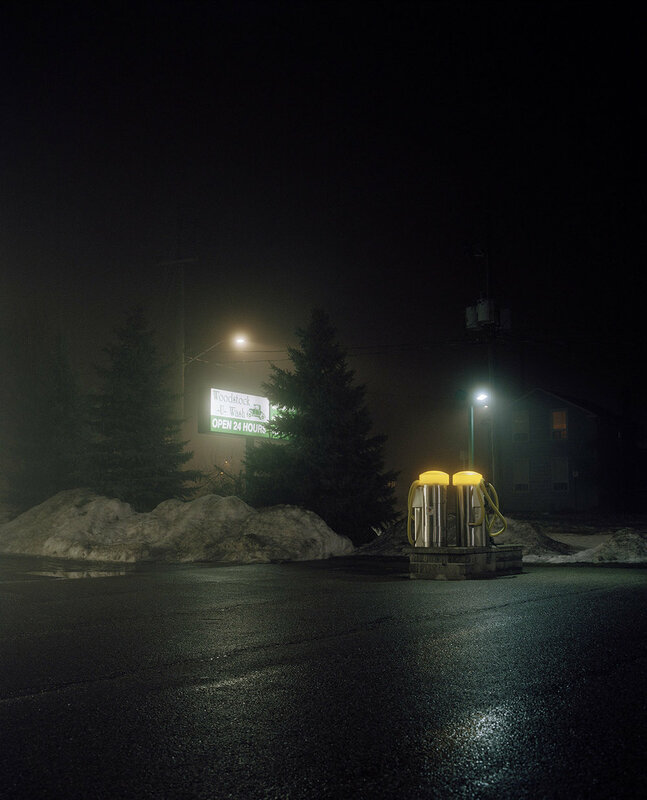 At first glance, they are straightforward: a classic portrait of a man in his work clothes, mist, trees that rise behind him; a gas station illumined. But their simplicity belies a complex history, both public and personal, that Catt weaves through the work with a careful hand. At 21, Catt’s aunt moved from England to Woodstock to marry a Canadian, after months of caring for her mother — Catt’s grandmother — who was struggling with her mental health. After she gave birth to her first child, her sister — Catt’s mother — came to visit, helping her care for her newborn. Six months later, after various failed attempts, their mother succeeded in taking her own life. 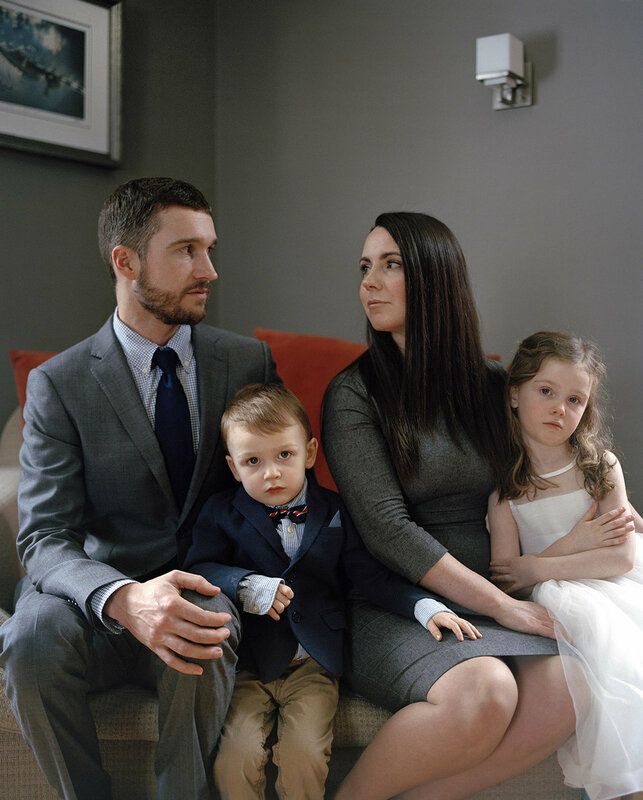 The family was thrown into disarray; Catt’s aunt returned to England, her baby in tow, to pick up the pieces and, though she remains a Canadian resident, she travels back to the UK annually. Woodstock opens with a portrait of Catt’s aunt, close up, her cornflower-blue eyes looking ahead, almost mournful, the past visible in them. The photographer is conscious of the parallels in their respective timelines: at 19, Catt herself was at home, caring for her mother’s own poor health, and deciding what path to take next. It was her aunt that encouraged her to go to university, to make choices for her own life, to take courage; her aunt’s experiences in the role of carer, at a similarly pivotal moment in her life, were enough to convince her. As such, Catt felt it was fitting to open the project with her aunt’s portrait, given that it was her influence that led her to photography, and to Woodstock, to begin with. While making the work, Catt found herself as both an insider — introduced to each sitter by family, people embedded within the community for years — and an outsider, a stranger with a foreign accent and a camera. On meeting people and explaining her work, Catt would often be told about some monument or natural vista she had to see and photograph; her cousin would laughingly explain that Catt was only interested in things you wouldn’t think she’d want to capture. She is met with a bemused tolerance, and this insider-outsider status lends her pictures an uncanny, transient quality: she’s there, but only because of a generosity or patience that could, at any time, be rescinded. “Travelling to Woodstock was my first experience of true culture shock. I was in awe of the fact that such a place really existed, just as my mother had been,” Catt explains. The town itself strangely reflects and refracts Catt’s own mixed emotional relationship to the place; though it’s known as the “Friendly City”, a close-knit community that is centred around industry and agriculture, it is dogged by an opioid epidemic, a proliferation of youth suicides, two high-profile murder cases. As a result, the series murmurs with a distinct but well-concealed ambivalence. 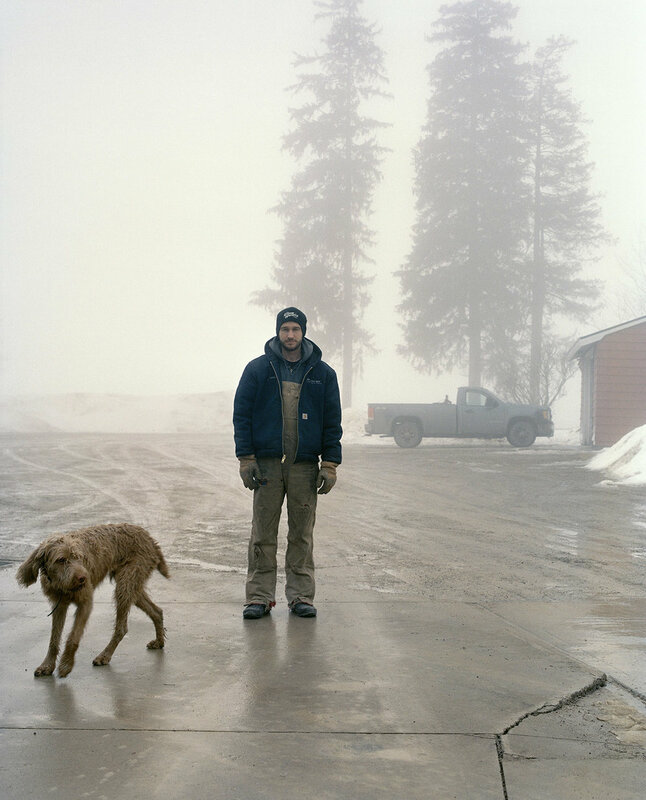 Exquisite landscapes, pale under mist or dripping with icicles, sit alongside portraits that pull and jostle with an underlying tension: family portraits in which people’s eyes fail to meet one another, or look towards the camera with a hint of suspicion or challenge. 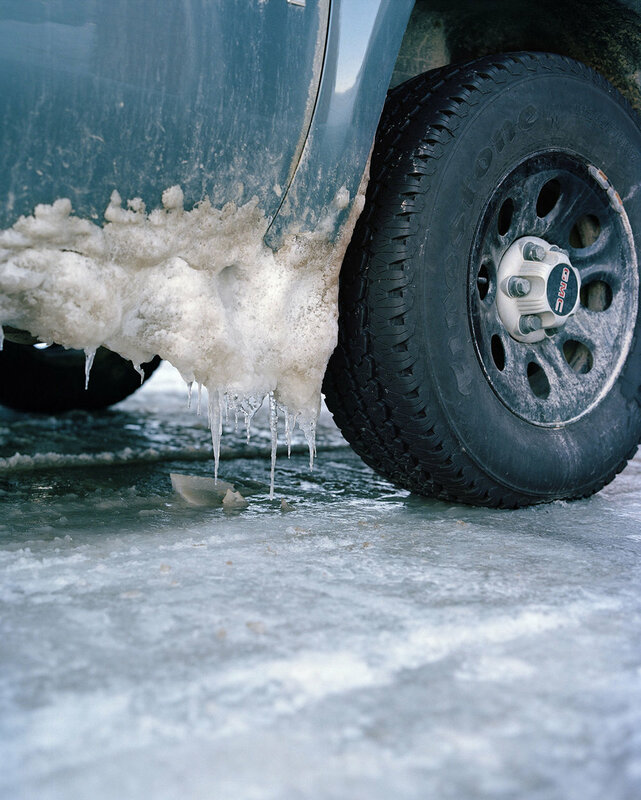 There is a sense that, though the series is made up of many visits Catt made in different seasons, the sterile yet sparkling winter landscapes hold the most essential truths about the place itself, as though the troubles of its context are frozen in time like ice.